Arthur Conan Doyle’s great detective Sherlock Holmes is rediscovered by TV series and filmmaker fans every few years and each new work starring Holmes and his sidekick Watson, has the maker’s own stamp on it. Robert Downey Jr. Benedict Cumberbatch, Johnny Lee Miller have all played Holmes in recent times with varying degrees of cool. Kaushik Ghatak hat-tips Holmes in the credits and then goes on to make Samrat & Co., which is more a parody than a tribute. The good-looking Rajeev Khandelwal plays Samrat Tilak Dhari, with the unfortunate initials STD; his assistant/companion is Chakra Dhar or CD, an annoying anchor of TV crime shows. A young woman, Dimpy (Madalsa Sharma) approaches him for help. Her father Mahendra Pratap’s (Girish Karnad) Shimla Estate has had some strange goings-on and she wants STD to investigate. In the huge Shimla mansion, there is the usual assortment of family members, friends and employees who provide the list of suspects and red herrings when Mahendra Pratap is murdered. Before that, there is a giggle-inducing scene in which he shows off Shakespeare’s feather quill to Samrat. This astonishing prop then never reappears. As Samrat investigates, more corpses turn up, which just ups the boredom quotient of the film. 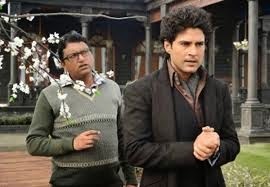 Khandelwal has tremendous screen presence (you try not to notice his frequent hair style changes) and could have made for a fine private eye in a better film—this one does not even reach the entertainment value of TV’s CID. The way the film ends, it looks like there are plans for a sequel. This sort of thing just might work as a TV series, a film needs much more imagination... and novelty. Otherwise, to use a Samrat-ism: what’s the point?